The best-selling Bluetooth earbuds on Amazon right now aren’t Beats and they aren’t Bose. They’re the Mpow Flame Bluetooth Headphones, and it’s pretty easy to see why. 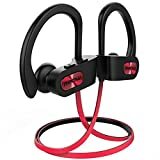 These top-rated in-ear headphones feature a sleek design, great sound quality, impressive battery life, IPX7 water-resistance, and an insanely affordable price tag of just $20 on sale. But if you use the coupon code CYP227SB at checkout today, you’ll snag a pair at an all-time low price of just $16.98!